MULTAN – The police officials investigating the murder case of social media celebrity Qandeel Baloch disclosed before a court that Qandeel was strangled to death at the house of a friend of Mufti Abdul Qavi. The revelation was made during a hearing of the murder case at the Multan district and sessions court on Monday. Appearing before the court, the father of slain social media entertainer Qandeel Baloch alleged that his daughter was killed at the behest of Mufti Abdul Qavi, an influential cleric. Muhammad Azeem, along with his wife Anwar Bibi, told a magistrate in Multan on Monday that they would not forgive anyone who was involved in his daughter’s murder. The cleric, Mufti Qavi, who is currently in police custody after his pre-arrest bail was rejected by a court earlier in October, was also present in the court of Judicial Magistrate Pervaiz Khan. On the other hand, three lawyers representing Mufti Qavi argued before the court that police were unable to gain anything despite an 11-day remand of the cleric while requesting the court to grant no extension in remand. The defence counsel maintained that the polygraph test had no legal standing. Appearing before the local judicial magistrate, Mufti Qavi reiterated his innocence and told that he had done nothing illegal and that whatever had happened was on the record. Born Fouzia Azeem, the model and actress who was dubbed as ‘Pakistan’s Kim Kardashian’, was found strangled to death in her house in Multan’s Karimabad area on July 16, 2016, months after her selfies with Mufti Qavi went viral on social media leading to suspension of the cleric’s membership of the Ruet-i-Hilal committee and the National Ulema Mushaikh Council. Qandeel’s father claimed that she was killed by her younger brother, Waseem, in the name of honour. Waseem was arrested by police in Dera Ghazi Khan later that night and confessed to killing her in the name of ‘honour’. 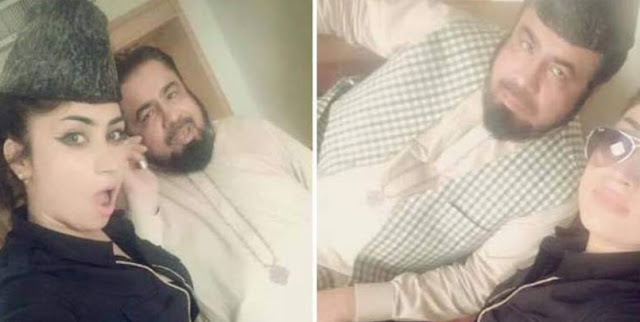 Investigating Officer Asif Shahzad asked the court for a three-day extension in the cleric’s physical remand, saying that police was likely to get the results of a polygraph test conducted on Mutfi Qavi soon, on the basis of which they would be investigating further. The court has adjourned the hearing until November 20th to deliberate the matter of the extension in Mufti Qavi’s remand. 0 Response to "Qandeel Baloch strangled at house of Mufti Qavi’s friend, police make sensational disclosure before court"